Explore the Sunken Forests in Lake Marion with Fisheagle Tours! Narrated 2 hour tours for groups and families includes information covering the building of the Santee Cooper Lakes and the wildlife that now inhabits this rare and beautiful sunken forest. You will hear of Indian customs, old moonshine stills and past inhabitants of Lake Marion, the largest lake in South Carolina. 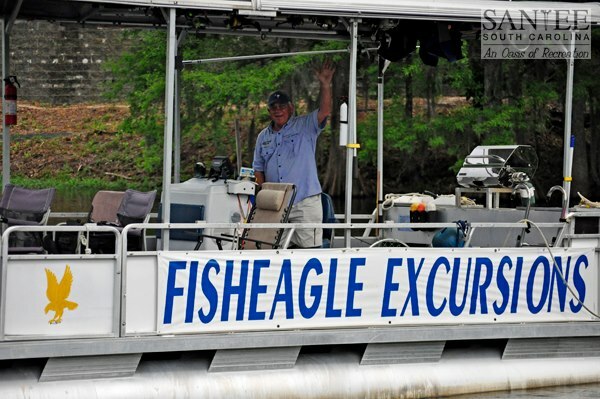 Explore the watery trails in the safety and comfort of the covered 40′ pontoon “Fisheagle” boat. Ospreys, Anhinga, Great Blue Herons and other beautiful water birds can be observed during the different seasons – don’t forget to bring your camera! The elusive American Alligators lurk, feed, mate, nest and sun themselves in the areas that are toured. Fisheagle will try to make sure that you see one on your trip, but remember that this is a true wildlife tour, not a caged zoo. The unpredictability of what lies beyond the next bend makes this outdoor experience awesome and exciting. No two tours are exactly alike. Call for rates and to schedule your trip at (843) 563-771 or 800-967-7739. Days of operation and times of departure vary. You could also email richard@fisheagle.net for more information or visit www.fisheagle.net. Fisheagle Tours is located inside the Santee State Park and information brochures are available at the park.